PALO ALTO, CA--(Marketwire - January 24, 2008) - Light Crafts today announced the immediate availability of LightZone 3.4, the latest release of its award-winning photo editing software. This recent iteration includes seven style families and 38 pre-defined styles that can all be viewed and applied directly with just a click of the mouse. LightZone 3.4 is available for download here. LightZone™ now instantly displays a real-time visual thumbnail preview of the picture rendered in the chosen style. Users can utilize this feature by simply holding their mouse over a style name. One click easily applies the selected style to a photo providing instant gratification. Multiple styles can also be added to the same photo to create combination effects. When used in conjunction with the Relight Tool, users have the power to enhance a large library of photos quickly and easily. LightZone's ease-of-use of these photo modifications frees up more time for special images that require added attention, and provides you with an end result you will be eager to share, store and publish. "We live in a society that thrives on instant gratification and photo editing is no exception," said Fabio Riccardi, chief executive officer, Light Crafts. "Our latest version of LightZone allows users to instantly apply a number of styles to their photographs -- it really doesn't get much easier. With each release we aim to have the user make more and more photo editing choices by using their eyes, not their ability to push and pull slider buttons." As always, LightZone™ preserves original photo files. Regardless of whether it is a RAW, TIFF or JPEG, the original photo remains unchanged, and ready for creating new versions. Therefore, users can modify the same original photo as many times as needed. Users can experiment with cropping photos multiple ways and even starting over and continue editing from any point, even weeks later. 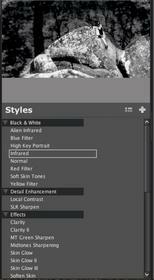 Converting to Black and White with Sepia toning or boosting color saturation to "wow" levels has never been easier. Each image change you make is stored inside of a new result file (as a JPEG or TIFF), so it never overwrites your original. The free LightZone™ for Linux Beta will also be updated to 3.4B, maintaining feature parity with the Mac and Windows release. The beta test period is expected to last until May 1, 2008, with periodic update releases throughout. The LightZone™ for Linux 3.4B release is available for download at http://www.lightcrafts.com/linux/index.html. Light Crafts recognizes the diversity of the Linux platform and incorporated feedback from the Linux community into the newest Beta II version. The lengthy beta period is planned to ensure that the LightZone™ for Linux version is robust across a large number of Linux variants and configurations prior to releasing a production version. Light Crafts will collect additional Linux Beta feedback across a larger number of distributions that can be incorporated into the final product. LightZone 3.4 is available through February 15, 2008 at a $50 discount for either the 'full' or 'basic' editions bringing the purchase price to $199.95 and $99.95 respectively. Both can be downloaded at http://www.lightcrafts.com/store/index.html. You can view a brief demo at www.lightcrafts.com. Linux 3.4B is available free of charge and available for download at http://www.lightcrafts.com/linux/index.html. LightZone™ photo editing software makes it easy for photographers and photo takers of all experience levels to quickly improve volumes of photos. The unique 'visual pick and choose' approach transforms photos based upon viewable results rather than requiring users to master and manage large numbers of masks, layers and specialized tools for each and every photo. Headquartered in Palo Alto, Light Crafts' patent pending image processing technology has powered LightZone's suite of intelligent tools since 2004. For more information, please visit http://www.LightCrafts.com/.